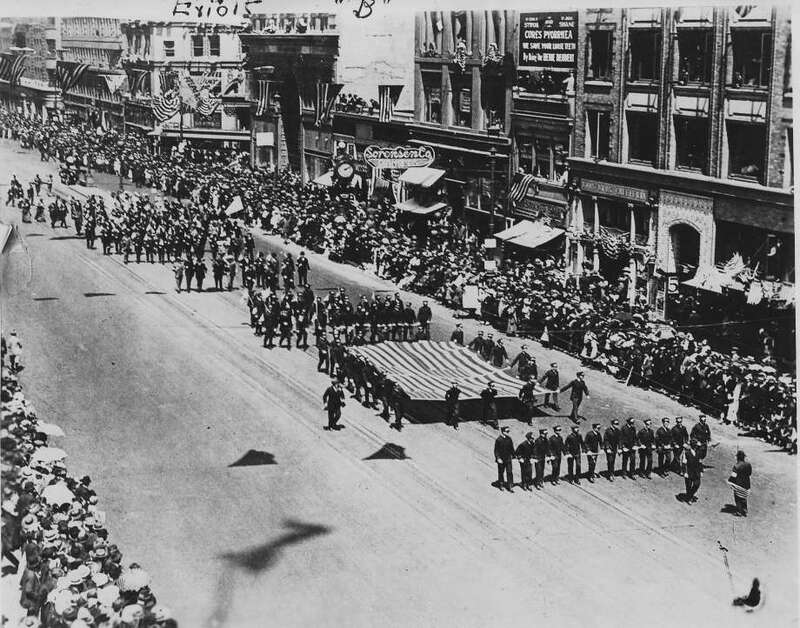 In 1916, the United States was on the brink of war, as Europe was engulfed in what later was called World War I. San Francisco held a massive parade on what was called Preparedness Day, in order to put its support behind and help the city and country get ready for entering the global conflict. Preparedness Day demonstrations happened nationwide, providing support to the American military for the anticipated entry of the country into the war. The date was July 22nd, 1916. The parade was massive consisting of a three and a half hour procession involving 51,329 marchers and 52 bands! 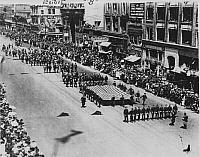 But sadly about a half hour into the parade, at 2:06 PM, tragedy struck as on the west side of Steuart Street, a pipe bomb went off, sadly killing ten bystanders and injuring an additional forty. The bomb had been created using metal slugs as shrapnel, thus increasing its lethality. Pro labor, working class individuals who were afraid of a potential draft should the country enter the war, additionally saw the probable war as a way for big business to make money providing weapons and resources for the war effort. 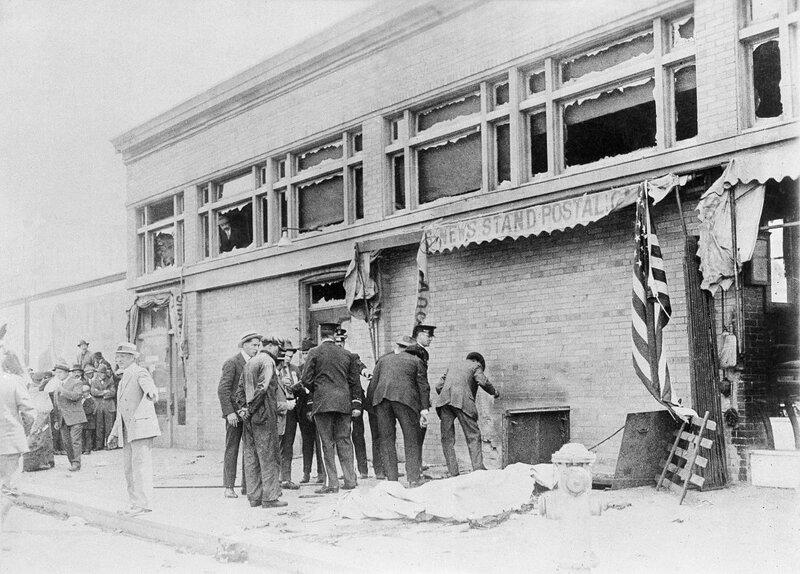 Mostly due to their past actions (both had previous arrests tied to incidents involving dynamite for example) and a fit to the working profile, two local radical labor leaders, Thomas Joseph Mooney and Warren Knox Billings, were accused of the crime and arrested. During the trial, a photo came to light showing Tom Mooney. Also in the picture was a clock located then in front of Burnett Brothers Jewelry Store on Market Street along the parade route. Experts believed that the photo was taken around 2:01 PM, five minutes before the explosion. From Mooney's location in the photo it would have been impossible for him to have planted the bomb and then made it through the crowds to that location given the time frame, thus giving him an alibi for the bombing. Despite the photo and lack of any other actual evidence, both Mooney and Billings were convicted and incarcerated in prison. Mooney was sentenced to hang while Billings was handed life in prison. Mooney's death sentence was changed to simply life imprisonment two weeks before his scheduled execution, by then California Governor, William Stephens, who was asked to look into the case by President Woodrow Wilson. E. Howard also made the clock set in the tower of the San Francisco Ferry Building. It is the largest dialed windup mechanical clock in the world. It was made by E. Howard in 1898. The clock was originally run by a weight and pendulum system, and only lost two seconds a week. The system is still in place, but no longer used, as the clock is now powered by an electric motor, first installed in 1974. The weight still hangs in a 48 foot shaft that back when it was wound would keep the clock running for eight full days. The pendulum is sixteen feet long. At the time of its construction, the clock faces were, at twenty two feet in diameter, the largest in the United States. It was not until 1939, however, that Mooney and Billings were finally released from prison, 22 years after having been wrongfully convicted! By then, it had come to light that witnesses had out right perjured themselves (for example, one hadn't even been in the city that day), evidence in the case had been tampered with, and false testimony had been given. Public outrage at this led to further inquiries, which eventually lead to action by the state governor in 1939. California Governor Culbert Olson pardoned Mooney and simply commuted Billings's sentence to time served. Billings was not actually pardoned until 1961. Sadly the real bombers have never been found. Prominent anarchists have been suggested as potential bombers, as have German saboteurs, but the real perpetrators were never identified. The clock in the picture is now known as the Alibi Clock! It was originally built in 1914 by E. Howard and located outside Burnett Brothers Jewelry Store on Market Street in San Francisco. In 1932, the clock was relocated outside of Simon's Jeweler at 320 Georgia Street in Vallejo. Simon's Jeweler closed in 1984, but luckily the City of Vallejo purchased the clock, moved it just a few feet down the street outside of 316 Georgia Street. There it stood outside Brown's Jewelers. They took care of the clock until Robert C. Brown Senior, owner of the business passed away. Brown's Jewelers closed after being there for five decades. The Public Works Department of the City of Vallejo now maintains it. On September 20th, 1984, the Alibi Clock was designated City Landmark Number 5. A mural depicting the events of that fateful day back in 1916 can be found at the Rincon Center. Back in the 1940s, Anton Refregier painted twenty seven different murals depicting various historical events in California. At the time the murals were then on the San Francisco post office. The mural that depicts the bombing and subsequent trial is panel #23.